We are committed to making a difference in our community, locally and nationally, and in the wider world. St. Elisabeth’s has been part of programs for many years, such as the Interfaith Soup Kitchen in Evanston, and continues to discern new ways that we can effectively make things better, such as our initiative this year to become a Family Promise host church. You can help feed the hungry. St. Elisabeth’s members along with family members and friends in our community come together to help feed the hungry at the Interfaith Action Soup Kitchen in Evanston. On a Soup Kitchen day, we begin with making sandwiches and sack lunches begins at 2PM at St. Elisabeth’s and the meal is prepared and served and the sack lunches distributed at First United Methodist Church in Evanston beginning at 5PM. Please visit our Soup Kitchen page for more information. 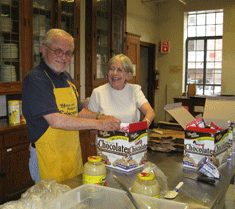 For more information about the Interfaith Action Soup Kitchen, click here. St. Elisabeth’s is excited to be part of Family Promise, and while plans are still underway to become a host church, we are teaming up with the other houses of worship in Glencoe to participate in this vital program. Please see our Family Promise page for the latest and further information about St. Elisabeth’s and Family Promise. Each week at the 10 AM service, the children of our parish collect nonperishable food that is taken by a Sunday School family every month to the New Trier Food Pantry. St. Elisabeth’s proudly brews Bishop’s Blend Coffee and Teas for Coffee Hour and parish events. Bishop’s Blend is fair-trade and supports local farmers and communities as well as a portion of all proceeds go directly to Episcopal Relief & Development in support of their great work domestically and internationally. We know through small steps like this, we can make a difference in the lives of many. We also support Episcopal Relief & Development through their appeals, when disasters strike communities, to help in their aid efforts. 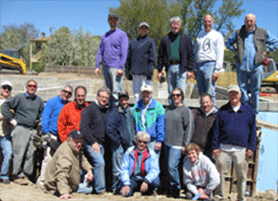 St. Elisabeth’s is a charter member of Glencoe Interfaith Builders, which works with Habitat for Humanity in Waukegan.